In theory, well-adjusted people should be glad when friends succeed. What kind of shotgun bro wouldn’t happily cheers tallboys of Natty Light with his wheelman after pulling an awesome donut in the Wal-Mart parking lot? What golfer wouldn’t share an atta-boy high-five with a pal who just knocked in a 15-footer for birdie? It’s when those accomplishments stack up, however, when your bro pulls the donut in front of some admiring girls (driving his brand new Ferrari) or your pal birdied his fifth hole in a row to beat you by 16 strokes (in front of some admiring girls, in front of his new Ferrari), that the sweet taste of joy curdles into a lumpy reminder of your own shortcomings. We, or maybe just I, celebrate another’s accomplishments insofar as it approaches, paces, or laps my own. Lately, it’s been difficult to fete my fellow humans in their triumphs, from the latest Powerball millionaire to the lucky chump who found a five-dollar bill in his old coat. Thus, I grudgingly celebrate receiving the first insult written by a friend. Meet Mark Svartz, author of I Hate You, Kelly Donahue. Like many humorists, Mark manages to see the ghost of levity in an otherwise ordinary situation, a Cole Sear trapped in a room full of darkly funny observations that only he can see. Mark’s the type of friend who says what you were about to say, except a bit funnier, a tidge more accurately, and oceans more lucidly. For this reason, time spent with Mark can be as frustrating as it is hilarious. Which is a fine segue to and facile description of his first book, I Hate You, Kelly Donahue. I laugh, but there’s a twist of jealousy with each turn of the page. Not only because I’m in a constant race against everyone I know to be the best at everything I enjoy, but because once again Mark was funnier than me. Doesn’t matter that he never considered me a rival; he’s part of the competition. The envy is there because I’m again black-eyed and canvassed, beat to a punch the other guy didn’t even know he threw. It’s a damn good punch. 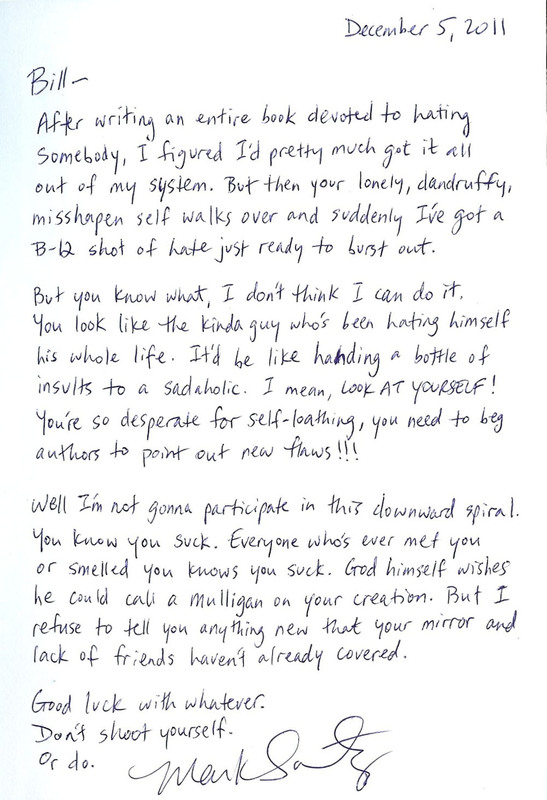 I Hate You is something very different in form but very familiar in concept: a diary of impotent, furious, almost arbitrary hate, written in Mark’s own scrawl, complete with creepy mementos fished from the target’s garbage and wary emails BCC’d to HR heads. Imagine if Kevin Spacey from Seven had a baby with Dan Savage, and to that baby add the coworker who haunts the thermostat and sends nasty emails over unmade coffee pots, and you’ve got something close to I Hate You’s narrator. It’s the story of one man’s pure distaste for an attractive coworker. Let the first office worker who has never obsessed over and stared laser beams of hatred at the annoying bimbo in Accounts Receivable throw the first sexual harassment lawsuit. Ultimately, clutch as I might, I can’t hold onto the jealousy. Mark is a slippery-nice guy who just happens to be a half-second faster to the joke, a satisfying career’s worth of approval brighter in his parents’ eyes, and a single published book ahead of me in the race. As much as I’d love to write something like I Hate You, Mark Svartz, it’s impossible. Not only because he’s probably already writing that book, but that he seems as excited about being published as I imagine I would. Just a few days ago, he admitted to hanging around the humor section in a Barnes & Noble until someone picked up his book. Unfortunately, however, she put Mark’s book back on the shelf. She must be waiting for mine to come out. Until then, if you’d like to buy his book or just write a nasty review you can find Mark’s book on Amazon. As always, great job, Bill. I look forward to the time when you can write yourself an insult on the inside page.